Diamondback moths may be a mere half-inch in length, but their voracious appetite for Brussels sprouts, kale and cauliflower make them a major pain for farmers. This week, the U.S. Department of Agriculture approved a potential solution: moths genetically engineered to contain a special gene that makes them gradually die off. A field trial slated to take place in a small area of upstate New York will become the first wild release of an insect modified using genetic engineering in the US. The moths have been engineered by the British biotech firm Oxitec, the same company that last year caused a stir with its plans to release genetically modified, Zika-fighting mosquitoes in the Florida Keys. The diamond back moths take a similar approach to the mosquitoes, modifying male mosquitoes to limit the population over time by passing on a gene to offspring when it mates with wild females that causes female moths to die before they reach maturity. The technique is a riff on an approach used to manage agricultural pests since the 1950s known as “sterile insect technique.” Using radiation, scientists made insects like the screwworm unable to produce viable offspring. By 1982, screwworm was eradicated from the US using this alternative to pesticides. In “Silent Spring” Rachel Carson suggested this approach was the solution to the dangers of harmful pesticides agricultural producers required to protect their crops. The problem was that it did not work on every insect—in many cases, it simply left irradiated insects too weak to compete for mates with their healthier kin. 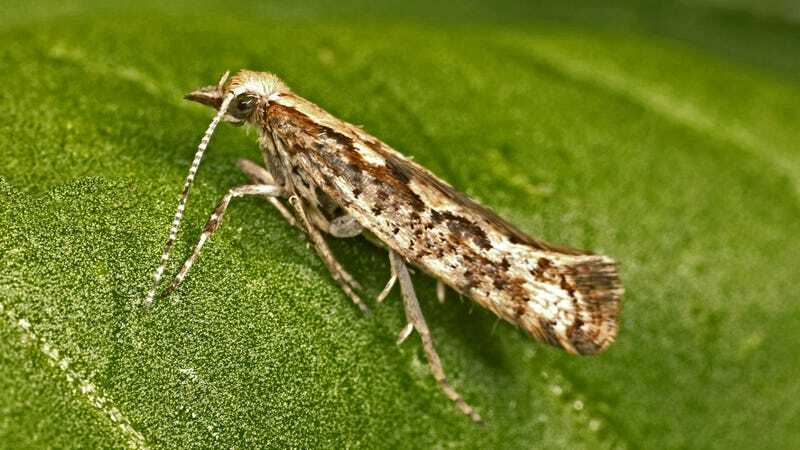 Diamondback moths are a sizable problem for farmers, and a problem that’s growing as the moths develop resistance to traditional pesticides. They do about $5 billion in damage to cruciferous crops worldwide every year. In the upcoming trial, a team at Cornell University will oversee the release of the genetically engineered moths in a 10-acre field owned by Cornell in Geneva, New York. After a review found that the field trial is unlikely to impact either the environment or humans, the USDA issued a permit that allows for the release of up to 30,000 moths per week over several months. It is caterpillars that damage crops, so the plan to release adult males that produce unviable offspring should not cause any additional crop damage. And any surviving moths will likely be killed off by pesticides or upstate New York’s frigid winter, according to the report submitted to the USDA. The plan to release modified mosquitoes in the Keys attracted much local ire—after initially getting the greenlight from the FDA, the project was ultimately stalled by a local vote and forced to find a new location for a trial. In upstate New York, too, the moths have stirred up a debate over GMOs for the past several years, though the plan has not been met with quite the same level of opposition. The approval process through the USDA rather than the FDA, too, was much swifter. In laboratory and greenhouse trials, the modified mosquito was reportedly effective in decreasing the overall population. But tests still need to determine how it will fare in open air. Oxitec has released its engineered mosquitoes Brazil, Grand Cayman, and Panama, and still plans to go ahead with a field trial in the Keys. In December, the company announced plans for field trials of a genetically modified Mediterranean fruit fly in Western Australia. It is also working on genetically engineering several other agricultural pests, including Drosophila suzukii and the Olive fly.